Building on its legacy of high-capacity, high-efficiency combines, Case IH is expanding its combine lineup with new 50 series Axial-Flow® combines, which includes new Axial-Flow 250 series combines equipped with optional AFS Harvest Command™ combine automation system. Designed to optimize grain quality and grain savings, the 250 series combines feature 2-speed electric shift ground drive, adjustable rotor cage vanes and an improved feeder house design. Plus, AFS Harvest Command automation simplifies harvesting by sensing and optimizing machine settings — regardless of operator skill level. Achieving optimal combine performance requires perfectly balancing ever-changing ground speeds with numerous settings and adjustments throughout a long day of harvesting. Until now, that meant carefully monitoring and tweaking those settings for varying crop conditions and terrain across the field throughout the day. 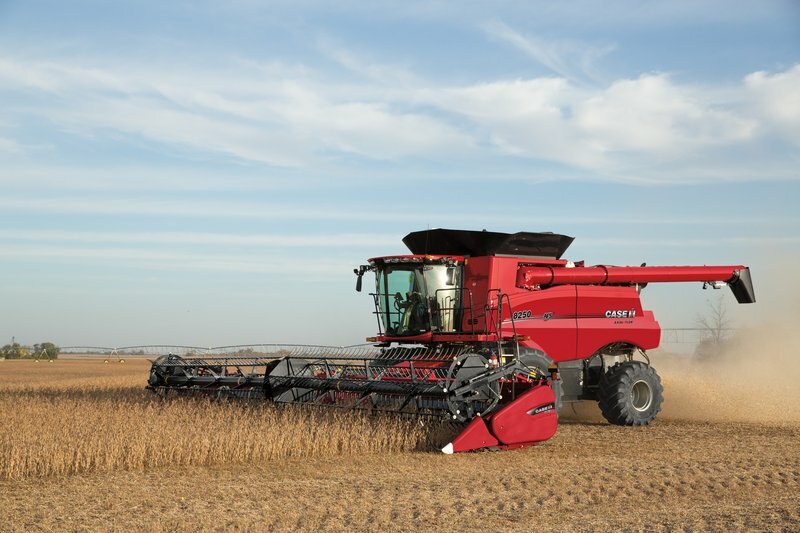 New from Case IH Advanced Farming Systems (AFS), AFS Harvest Command combine automation system — available only on the new 250 series Axial-Flow combines — utilizes 16 sensors to automatically adjust seven combine settings. It reduces the need for operator monitoring and adjustment from 12 down to just three, depending on the level of automation selected. Initially available for corn, soybeans, wheat and canola crops, AFS Harvest Command automation proactively adjusts the combine as crop conditions change, based on patent-pending technology. It’s simple. Operators just choose the mode of automation to match their harvesting goals. From there, AFS Harvest Command automation takes over. 1. Performance — Maximize grain savings and grain quality while optimizing throughput. 2. Grain Quality — Maximize grain quality while also saving grain and optimizing throughput. 3. Fixed Throughput — Operator can fix the machine throughput and the machine will adjust to save grain and maintain a quality sample. 4. 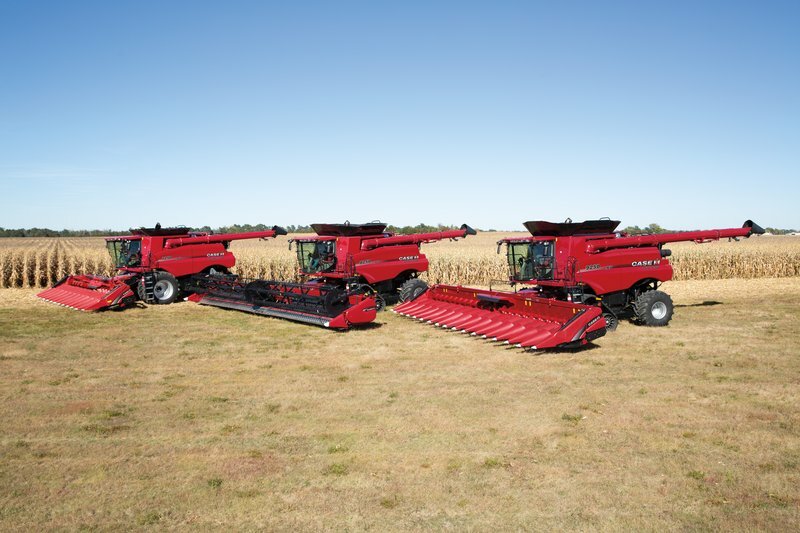 Maximum Throughput — Operator can maximize the throughput while automation adjusts combine settings to save grain. “Labor is important. Whether you’ve ran a combine for 50 years or 50 minutes, this machine is super user-friendly,” said Case IH customer Mark Bartlett, who operated an Axial-Flow 8250 combine with 3162 draper head. “The fact that you can grab someone off the street and get the same results as someone who has run one forever is extremely appealing to us.” Bartlett is from Colby, Kansas, and farms 5,000 acres of mixed crops, including corn, wheat and milo. Building off of the simplicity of the Axial-Flow family combines, the new 250 series features advancements for even more simple harvesting and operation, allowing producers to maximize throughput and grain quality. Three new Axial-Flow combines — models 7250, 8250 and 9250 — feature a streamlined design with easier settings and operation. Even new operators will achieve higher productivity without sacrificing grain quality. A new 2-speed electric shift ground-drive transmission increases efficiency in all terrain and ground conditions. With increased tractive effort and a wider speed range, much like cruise control in a car or pickup truck, the transmission maintains precise ground speed up or down hills for more consistent harvesting. It also reduces the frequency to shift in the field or on the road by having one gear for harvesting and another gear for roading. Within each transmission gear there is a Hi/Lo propulsion system to toggle between Hi and Lo ranges during harvest. This provides additional operator control when extra traction or change in speed is required. From the factory, this combine is available with three levels of technology to fit varying operation needs. Standard on every combine is the Automatic Crop Setting, which allows producers to customize and save preferred combine settings by crop on the AFS Pro 700 display. Or choose optional Feedrate Control to more accurately control ground speed based on crop load, engine power and ground speed limits set by the operator. Full automation is also available through the optional AFS Harvest Command combine automation system. Adjustable rotor cage vanes: 250 series combines come with optional in-cab adjustable rotor cage vanes. The rugged new design eliminates the need to manually remove bolts and pivot the cage vanes. This both saves time and allows the rotor to be fine-tuned to optimize threshing and separating in varying crop conditions and efficiently change from one crop to another. The standard feature includes a gang of cage vanes that are manually adjustable with an easy turnbuckle. Redesigned feeder house: 250 series combines have a redesigned feeder house for improved durability and reliability in demanding crop conditions. An optional feeder fore/aft face plate control enables adjustments to be made from the cab. A redesigned feeder top shaft drive coupler features a crown spline design for greatly improved durability. A simple, two-piece feeder floor design increases durability and improves crop feeding. Plus, up to 13,500 pounds in lift capacity helps handle even the largest chopping corn head on the market. Self-leveling cleaning system: Allows the 250 series combines to clean the grain and move it efficiently — even as the combine undulates across hills — to help save more grain and maintain harvesting ground speeds. The system now includes an in-cab adjustable pre-sieve that allows the operator to make adjustments on-the-go to maximize grain quality. This new Axial-Flow series matches the efficient harvesting of the AFX rotor with efficient power with Selective Catalytic Reduction (SCR) technology that meets Tier 4 Final engine emissions standards. The patented SCR technology allows for maximum horsepower (up to 625 peak horsepower for 9250 with 15.9 L), to power through demanding field conditions and high-yielding crops, resulting in better performance, increased fuel efficiency, lower operating temperatures, and greater reliability and durability. In addition, the high-capacity grain tanks of the 7250, 8250 and 9250 combines feature one of the largest grain tank capacities (410 bushels) currently available on the market. The larger grain tanks together with unload rates of up to 4.5 bushels per second allow operators to open up fields easily and unload quickly. Designed to commemorate the rich, 40-plus-year legacy of Axial-Flow combines, the new 150 series combine joins the 50 series combine lineup. The 150 series combines feature heritage styling, color schemes and decals of the original Axial-Flow combines. The memorable white cab tops and tire rims give way to the latest harvest advancements, including the Cross-Flow™ cleaning system, 2-speed electric shift transmission and a host of productivity enhancements. With the industry-leading single rotor design, Case IH continues to provide innovations suited to your individual farming operation. Each advancement is designed to deliver peak harvesting efficiency, grain quality and grain savings to help you simply harvest more of what you grow.